NYC, 02/03/2019, 2:00PM. Slight Perturbations: Two Compositions. John Driscoll’s first exhibition with the gallery is a collection of playful kinetic sound sculptures activated by visitors. Each instrument contains tiny microphones and speakers emitting feedback at ultrasonic frequencies above our hearing level. 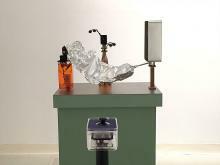 A reflective foil, set in motion by hand, motor, springs or joystick, modulates the feedback, generating audible sounds amplified through an array of unique speaker objects. As part of his ongoing exhibition, John Driscoll will perform two compositions: "Speaking in Tongues," using an array of ultrasonic instruments, and "Listening Out Loud" - a bowed saw duet with Cecilia Lopez. Driscoll's instruments are fashioned using foil reflectors, timing motors, servo motors, springs, and unique loudspeakers. Activated by small physical movements, his sculptures transform ultrasonic feedback into ethereal frequencies audible by the human ear. Cecilia Lopez is a composer and installation artist from Buenos Aires, Argentina. Her work explores the boundaries between composition and improvisation, as well as the resonance of diverse materials through the creation of non-conventional sound devices and systems.